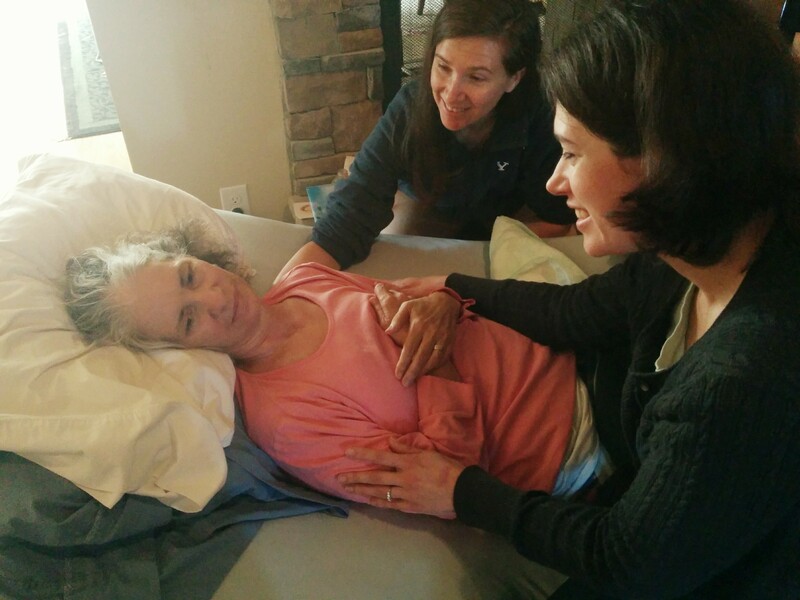 It has been hard to be here and see what is happening to Mom, but this home has become such a sacred place that I feel a strength carrying us along. I know that is also from the many prayers and manifestations of love everyone has been sending our way. Thank you for helping us through these times. Early this morning, Rachel left to catch an early flight back to Boston. Thank you, Rachel, for your sweet spirit and all the help you’ve provided during your stay. You will be missed. Later this morning, Mom’s neighbor and gardening friend, Marian, brought some beautiful daffodils from her own garden to brighten our home. She had a big red macaw sitting on her shoulder, who goes on walks with her around the neighborhood regularly. The bird would have been frightened if Marian had come into the house, so she chatted with Dad for a minute at the door about how Mom is doing before going on her way. We received a beautiful hand painted card from Mom’s brother Tim and his wife Sally. Thank you for your kind words and your beautiful gift. Betty, the weekend hospice nurse, came to visit us today. Mom’s heart rate and temperature are still above normal, but are down from yesterday. Her blood pressure was significantly lower. We sat at the kitchen table to chat a bit and she went over some things we’ll need to know in the coming days. She asked if we needed any chaplain services. Dad’s reply confused her, I think. “No thanks, we’re all chaplains here,” he said. At her surprise, he explained, “We belong to a church with a lay ministry, so we all can minister.” That led to a sweet family discussion after she left about what it means to minister to one another. Mom’s breathing has been mostly relaxed and even. It is weak, but consistent. Mom was pretty unresponsive most of the day, but this afternoon Rebecca got out Mom’s digital picture frame and she followed it with her eyes. We took this as an indication that she wanted to watch it, so Rebecca sat next to Mom and reminisced with her as the pictures scrolled by. We got phone calls from a few people today. Rebecca’s Hawai’ian bishop called with a very cheerful, “Aloha!” which I’m sure Mom loved. He remembered Mom from her many visits to the Carlson’s ward, and sweetly called to express his love and encouragement. Courtney also called to chat for a bit, which was really nice. Mom seems to still respond well to phone calls, even though she can’t say anything. We’ll be doing our nightly vigil again tonight, taking turns watching over Mom. Though it may be hard, as it is with much of what we are doing here, this is time that we cherish and will remember with fondness for years to come. Dad asked me to take the picture on the right. The one on the left is from their wedding day in 1972, taken by my grandfather. We pulled out Mom’s wedding dress to take this photo. Fortunately, Rebecca knew exactly where it was. 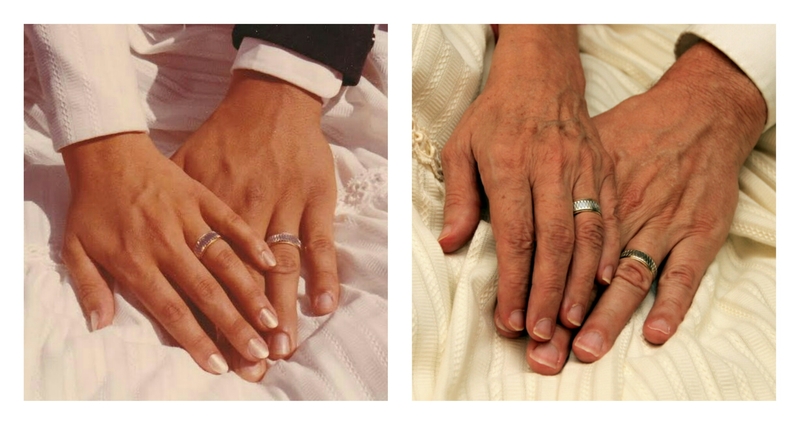 To me, these hands convey so much love and devotion. Thank you both for being such a wonderful example to me. Joseph left early this morning to be with his wife, who had knee surgery today. We were sad to see him go, but we all felt it is what Mom would have wanted. (I’m sure she’ll be guiding us for years to come by her example.) I’m pleased to report that the surgery went well and Kelly is on the mend. This morning I finished up work on the memory tree website with Brittany. I’m happy with the way it turned out and would like to invite anyone reading this to please share with us a memory or two that you have of Mom. There are already several very nice memories for you to read. The link is http://memory-tree.jigawot.net go ahead and go there right now. Don’t worry, I’ll wait. She’s been pretty sleepy most of the day. We swab her mouth and give her little bits of water through a straw. She can only barely swallow, so we have to be very careful how much water we give her. Tawny, Mom’s hospice nurse, came and took her vitals and helped us to make Mom more comfortable. Her pulse was down a little from last time (though, still higher than normal) and the slight fever she had yesterday has come down also. 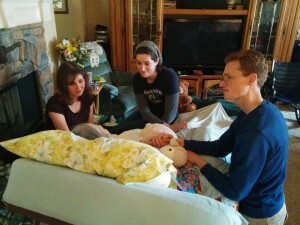 She said Mom looked comfortable and that we were doing a great job caring for her. This evening, Dad shared with us the presentation he and Mom put together on family history. They gave it at a stake Relief Society conference a while back and it was such a hit that they agreed to give it in all the wards during ward conference. Dad’s had to give it solo the last few times, which has been hard, but he’s been faithfully fulfilling his assignment. It was a very inspiring presentation about how we can do our family history and how important it is. Family history was always so important to Mom, it was great to hear her contributions to the presentation. This evening, we sang to Mom as we normally do. She can’t stay awake for very long now, so our singing is often shortened (and restarted later). We didn’t have Joseph with us, but we forged ahead without him. Before we were done, however, he called with Kelly to chat with Mom for a bit. It was very sweet to hear Kelly tell Mom how much she means to her. Their children sang to Mom over the phone and then Kelly sang to Mom. It was really beautiful. Rebecca made a comment this evening about Mom’s legacy that I thought was quite profound. She said that it is our responsibility to carry on Mom’s memory to our children: That it will be through our stories and recollections that they know her, and that we have the power to mold the way she will be remembered. I hope the memories I have of her never dim so that I can tell my children and my nieces and nephews so that they can benefit from the incredible example that my mother lived. Just like the last two nights, we’re staying up in shifts to be with Mom in the living room. She’s sleeping peacefully right now. We love you and are grateful for all your support. Mom slept most of the day. I doubt her rest was very sound last night. Her breathing has been labored all day. Jon arrived late last night and Rebecca will arrive tomorrow morning. We each have taken turns sitting next to Mom to comfort her as she drifted in and out of sleep. We’re doing our best to try and keep her comfortable, but since drinking any significant amount of liquid now is nearly impossible, we know she will not be with us for very much longer. Angie sat with Mom this morning and reminisced about our family reunion last summer at Lake Shasta. We all stayed in one big house, plus a tent in the backyard. Angie retold the evening devotional we gave about the Jaredites: we trooped all the family and “flocks” (aka, youngest grandchildren) out the backdoor (or the “city wall”), around the backyard (“wilderness”), and in another door to the living room, where we pushed the couches together to form “barges.” Mom’s eyes were wide and she was very attentive. Her eyebrows shot up when Angie described the stones being lit by the hand of the Lord. She certainly seemed to enjoy it. A couple days ago, I got a message from one of Mom’s high school friends who saw my posts on Facebook. She told me that she’d shared one of my posts on their school’s Facebook page and many of Mom’s great friends from those days responded, reminiscing about Mom and the impression she made on each of them. Today Joseph read these responses to her, and it was wonderful to hear how many people throughout Mom’s life had great respect for her beauty, intelligence, and kindness. We had a bit of a scare tonight as Mom’s breathing got very difficult, with occasional moments where she’d skip breathing altogether. We all gathered around her, but Mom worked through it and started breathing more easily after we shifted her around a bit on the bed. Tonight we did our regular round of singing, with the whole crew minus Rebecca, who is currently flying over the Pacific on her way here. We asked Mom if she liked our singing, and we got a rare response where she nodded and raised her eyebrows a little. We’re each taking turns tonight staying up with Mom. It is nice that we have so many in the house to share the load of care. 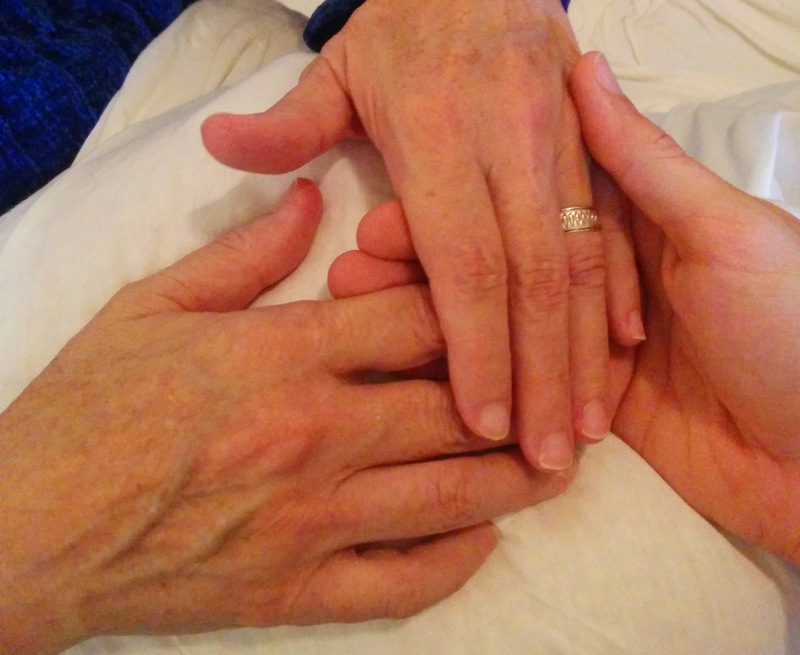 The other day, as I was holding Mom’s hands, I was struck by how much I love her hands and by how many emotions I feel as I look at them. I’m sure to most people, they look like ordinary hands, but when I see them I’m filled with memories of love and tenderness. I see the hours of labor she dedicated to blessing the lives of those most dear to her. I sense the commitment she showed to those she loved. I feel the calming and comforting peace she gave me in my times of grief or anguish. I feel the safety she provided to me as a child, the gentleness she used to guide me and teach me to walk in righteous paths. To me, these hands are the purest form of beauty. This morning Dad had a very tender moment with Mom. He was giving her some water (as he has done so faithfully for a few days now), and she just looked up at him with a very pleased look on her face. Her smiles are pretty faint now, but we can still tell when she does. She was looking steadily, right at him and Dad was delighted, so he said, “Can I kiss your smile?” He did so and she smiled even more. Dad found Mom’s copy of her patriarchal blessing and read it to her. It was another very precious moment to hear about her life and see how faithful she was to the tasks that she was entrusted with. I had never heard her blessing in its entirety and I had no idea that so much of her life was dedicated to fulfilling her mission. Her family has been the most important thing to her — I always knew that — but now I understand a little better why it was so important to her. She was being obedient to her most important responsibility. What a great example of faith and dedication. Rebecca called this afternoon and all of her children (at home, that is — her oldest is at college) took turns telling Mom how much they love her. Then at the end, they said it all together with an enthusiastic, “Aloha!” They live in Hawai’i and Mom has found many opportunities to go visit them. Who wouldn’t want to? Hawai’i has always held a special place in Mom’s heart. Later this evening, Rachel’s children called to express their love. Rachel’s children are a bit younger, so not everyone can speak yet, but we still heard from them all regardless. It was very sweet to hear from her beautiful children also. Mom loved every minute of it. Rachel was lamenting that her kids couldn’t say something like, “Aloha!” at the end… they don’t really have an equivalent in Boston. We tried to come up with some ideas, but something like “Yo!” just doesn’t have the same ring to it. Jason and Tiffany joined Rachel, Joseph, Angie, and me in our singing tonight. Her eyes were already drooping when we started, so we sang her to sleep and then sang a little more together. Mom slept a lot today, and her swallowing and coughing are weaker. She hasn’t been able to drink as much and she has eaten only a few spoonfuls of food all day. Her breathing has been a little more labored also. In her most “present” moments, she still loves to just look at each of us and listen to us reminiscing. This morning I made palacsintas for breakfast and Rachel whipped up some whipped cream. I asked Mom if she wanted to lick the beaters, and since she didn’t say no, we gave her some. Who doesn’t like a little fresh whipped cream off of a beater? Throughout the day, I’m frequently saying, “We sure love you, Mom,” or just, “I love you,” or, “We love you.” This morning, when I said it, she started to try and say something back. It was very faint, but she distinctly started saying, “I love… I love,” but couldn’t quite get the words out. “You love us, too?” I offered. Then she just mouthed the words with a look of relief on her face, “I love you, too.” That was all I heard from her all day. Angie and Rachel went to run some errands and I think Joseph was catching up on some work, so it was pretty quiet this morning. Dad had a few minutes to sit alone with Mom and I could hear him talking softly to her from the other room. I couldn’t hear what he was saying, but I could sense his sweet kindness in the sound of his voice. This afternoon Dad put on Fiddler on the Roof, one of Mom’s favorites. It was fun to listen to the wonderful music while I tried to get a little work done from my bedroom. Of course, I still have the music stuck in my head, but I don’t really mind since I love it, too. Spring is springing here in Georgia and there are a few trees that have blossoms that have opened in the last day or so. Mom loves gardening so much that we figured she would like to go and see her trees. We loaded her in the wheelchair and rolled her down to the pool room where her indoor lemon tree is potted. We helped her to smell the one blossom that has bloomed on that tree and then showed her the peach tree outside that has little pink blossoms all over it. It was a little cold and wet outside, so we just admired the tree from the comfort of the house. For Family Home Evening tonight, after our opening song and prayer, we took turns reading from a little wooden box Mom kept in her office. It is shaped like a little treasure chest and has little slips of paper inside and the words “My Treasure Box of Precious Memories” on top. She started writing down special memories on a little slip of paper and storing them inside. She had about 20-30 inside. I’m not sure how long she’s been doing it, but I got the impression is was in the last several years. There were things in there about going to weddings, going to high school performances, things from way back, like details about our births, etc. It was a great activity. Tonight we sang to Mom again, as we always do. Jason joined us, as he has these last few nights, and we sang Mom to sleep. At one point, Angie said, “We love you.” Mom’s eyes widened a bit — her indication over the last few days that she is very present and aware at that moment. Her eyes were replying, so Angie spoke the words for her: “And we know you love us, too.” Mom nodded. It was another very sweet day with our mother. Thank you for all your prayers, love, and support. We know many of you wish you could be here; we’re grateful for your care and concern. We hope you still feel a part of things through these posts.